This is like no other chip you have had before. Why? It’s because it is made from wholegrain, not potatoes. They are made from corn, wheat, oats and rice with just a little High Oleic Sunflower oil and sprinkle of seasoning. This makes them a great a great source of wholegrain with less saturated fat than other potato chips. There is a delicate sour cream and chive flavour that works really well with the wholegrain chip, very moreish. Wholegrain Cereals (72%) (Corn, Wheat, Oat), Sunflower Oil, Palm Oil, Sugar, Rice, Whey Powder (Milk), Salt, Onion Powder, Dextrose, Tapioca Starch, Yeast Extract, Natural Flavours (Wheat, Milk, Mustard), Garlic Powder, Food Acids (Lactic Acid, Citric Acid), Herb (Parsley). Grainwaves the best I ever had! My kiwi Fiance told me about these chips and why not? I order a pack. Got them today, and once I open it I just could not stop! 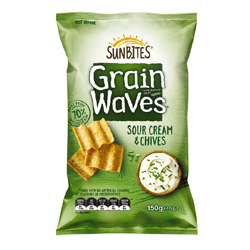 They are the best chips I tried..I really gonna get some more of the grainwaves goodness..yum!